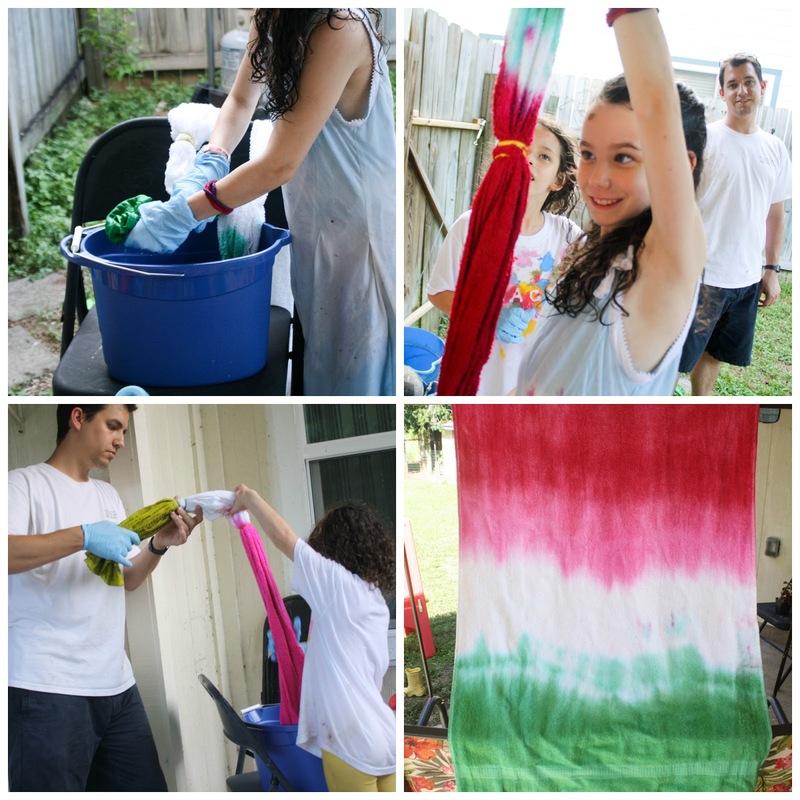 I've been scared to death to attempt tie dye with my kids for a long time now. And since I don't love the look (most of the time) there's never really been a reason to risk the stained hands, clothes, house, LIFE, etc. 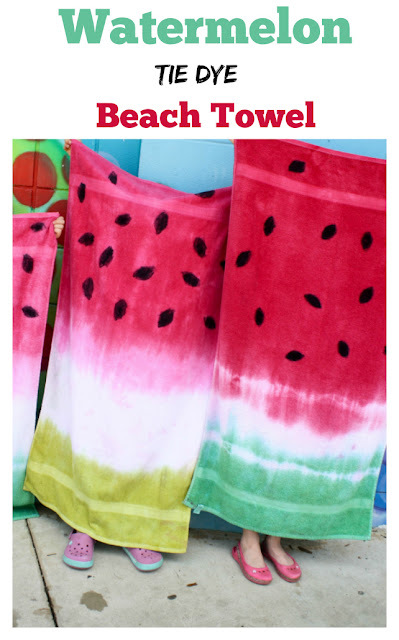 The other day, though, when I saw these adorable watermelon tea towels and realized that the same thing would work with beach towels, I knew it was time to take the plunge. When I turned to facebook to get some moral support and tips, my first piece of advice was a reassuring "DON'T!" from one commenter who does tie dye quite a bit but never with her kids. Her warning further solidified in my mind that if we were going to attempt this project, I really needed to think it through ahead of time. 1. Wet your towel. 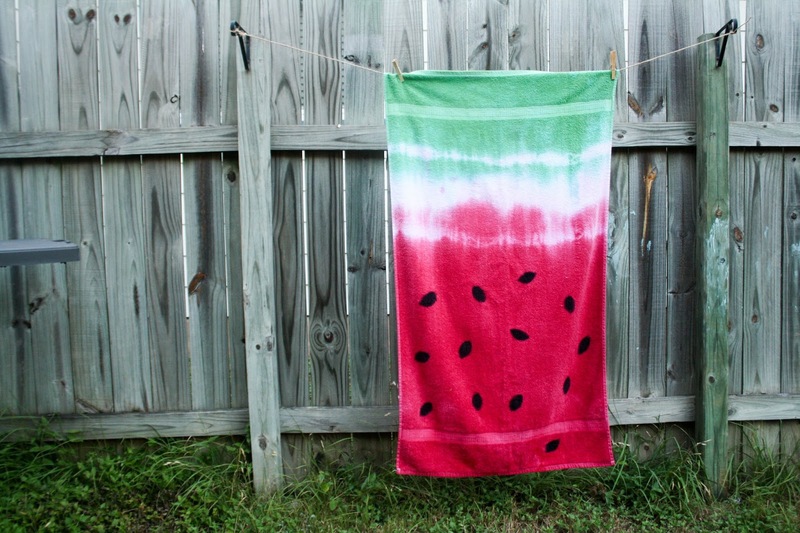 The wetter the towel the more blurry your dye lines will be. (I let the kids do this part with a hose in the back yard). 2. Tie the towel in two places with rubber bands. The space in between the rubber bands will be the white part of the watermelon. I made my white space a little bigger than I should have because I was afraid the colors would bleed into the white space, but they really didn't. 4. Dip one end of the towel into the bucket of dye. Dip as far as the rubber band or a little further if you'd like a faint white stripe there. (the kids did this part) Let it rest there for up to a half hour. The longer the rest, the darker the color. 5. Squeeze out the dye (use gloves) and repeat with the other side in the other color. 8. Hose the towels down again and wash separately from anything else (the first time they will bleed a little bit) in the washing machine with cold water. Time to head to the beach!